My long run will not only be a little shorter tomorrow at 13.1 miles, but it will also be a lot slower. I am pacing the 2:15 group at the South Valley Half Marathon tomorrow. I'm still not sure why I said I would do it, but I did. If I end up a terrible mess of a runner, I will blame Blaine. It makes me feel a little better that I can run it 23 minutes slower than I ran my last half marathon. But I'm a little nervous about holding a sign for over two hours. And I'm not a big talker while I run - one of the reasons running solo suits me, so it could be interesting if someone wants to chat for 13.1 miles. So tomorrow I'll need an entirely different kind of luck when I line up at the start. If you happen to be running the race, look for me and come say hi! I'll be the blonde wearing a bright green pacer shirt, holding the 2:15 pacer sign. I received a pair of Tommie Copper calf sleeves and a pair of knee sleeves a few weeks ago. I have been wearing the calf sleeves almost every day since, and I love them. I have two other brands of compression socks and calf sleeves, and I have always loved how they make my legs feel after I run. But there are a few things that are quickly making the Tommie Coppers my favorite. First is how lightweight they are. I can even wear them under jeans without getting too hot, which is a first. Honestly, I don't even notice they are there. I have also worn then on a few of my longer runs, especially when my shins have been a little sore, and they have made a huge difference in how my legs feel during and after my runs. I also like that the compression is not so tight that I can hardly get them on, but it is just tight enough to do its job. And the silky smooth fabric helps them slide right on. ... all Tommie Copper products are manufactured using a proprietary compression fabric combined with copper infused yarn that by design is so comfortable you may forget you are wearing it. Copper stimulates the immune system to fight infections, repair injured tissues, and promote healing. Copper also helps to neutralize "free-radicals" which can cause severe damage to cells. I also tried the knee sleeves. I have never really liked longer compression shorts because I don't like anything tight on the back of my legs just above my knees. I found the same thing to be true with the knee sleeves. I tried wearing them during they day several times, but always ended up taking them off pretty quickly. Yet I don't notice them as much when I sit still or lie down, so I wear my Tommie Copper knee sleeve to bed when my knee bothers me. And every time I have worn a knee sleeve to bed, my knee has been happy the next morning. So if you are a fan of compression or have been thinking about trying it out, you should head on over to the Tommie Copper web site. In addition to calf and knee sleeves, there are ankle and elbow sleeves, gloves and compression shirts. You can also find Tommie Copper on Facebook and Twitter. *Tommie Copper generously provided the knee and calf sleeves for free in exchange for my unbiased review. yay!! i think it is so cool you are pacing. you will do amazing! i had no idea knee sleeves even existed...i should check them out! You're going to do great!!!! Especially with those fab toes! Love it! hmmmm....as a nurse, i am on my feet 8 hours a day, just at work. i wonder if the knee sleeves would benefit? thanks for the review, and YES! have fun pacing!!!! Can you like tie the sign to yourself somehow so you don't have to carry it? I see a solution involving duct tape. Good luck tomorrow! I am way excited for you and kind of jealous. I would love to pace but was too scared to try the 1:40 group. You will do great though and I think you will really like it. 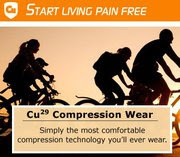 I love compression sleves and am excited to research this new brand. Yay for pacing! You'll be fine with the sign. Love the sleeves! TC is awesome. That's so nice of you to pace. I know all of the 2:15s will appreciate it. Last weekend I ran my first half marathon and I stayed with the 2:30s for a bit but then finished slightly ahead of them. It was nice to see the pace sign and know where I was at (I don't have a Garmin or anything fancy to help me). Good luck! I can't wait to hear about your pacing experience, that sounds so cool. I have never run in a race that has had a pacer. I would be so intimidated to do a pacing group! You'll be great though--have fun and enjoy it! Good luck tomorrow pacing those runners! That is something I want to do one day...but that sign holding seems tough! I totally agree with everything you said about Tommie Copper. The sleeves feel magnificent! Candice, you'll do fine and I'll buy you some chocolate milk after :). After the first mile, you don't have to hold it up so high and then if you swing your arms with the sign people will definitely stay out of your way. Great job on the race! I just saw the results on dailymile. You rock! I wear a great Knee sleeve from BraceAbility and absolutely love it! I highly suggest it to anybody looking to wear a knee sleeve.